Color Story | Citrus Color! Hi, friends, and happy first official day of Summer to you! I hope you had a really lovely week! Mine was, as predicted, crazy busy, but we had some really lovely weather the last few days which has been so oh so nice. Which very likely explains why I was feeling particularly inspired by these sunshine filled hues! Citrus inspired color is so absolutely pretty if you ask me. (Plus I’ve been on a big citrus kick here lately so I'm sure that only helps my obsession) So, here you are, my loves. A healthy dose of sunshine to kick your Summer off right! I personally love the idea of pairing pretty pops of color with a more subdued gray. That's why this palette is undoubtedly catching my eye. I particularly love the striped dress and that adorable chevron clutch! But then again, I'm sure you probably knew that. Because my passion for patterns is pretty obvious. Want to add a touch of whimsy to your day? I suggest incorporating some super fun garlands and/or pom poms! Such a lovely way to add a little pop of color. Wouldn't you agree? 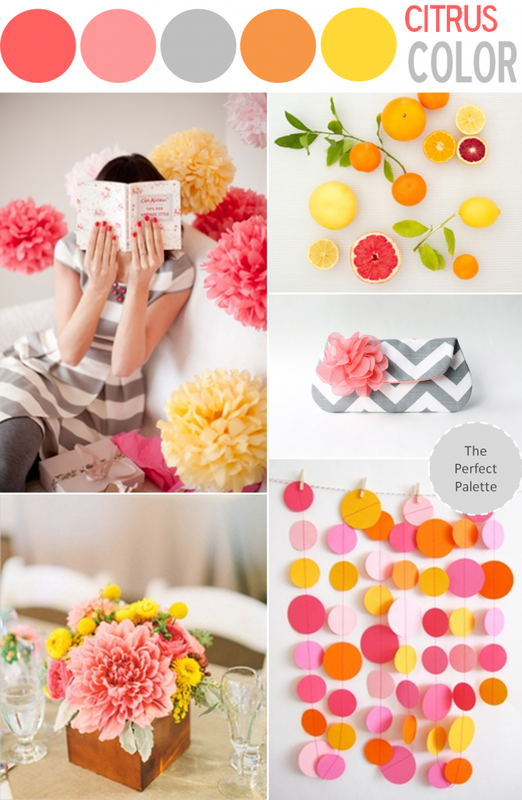 17 Comments " Color Story | Citrus Color! " Oh MY! I love this. Especially the striped dress. I love pairing citrus colors with gray! love this! Such an awesome palette for summer. Love the bright colors paired with the gray! Great color combination! Love how the citrus looks with stripes and chevron! You truly have an amazing gift, Chrissy, of creating such captivating boards! One of my favorites! So perfect for Summer! So bright and colorful! Really loving these happy colors. I love the way you paired the gray in with the citrus shades. Plus that dress & clutch are very gorgeous indeed!! Sweet colors!Love the beautiful shoot!